Color Sign Vertical 10" x 8"
Many medical & dental offices and bill payment centers ask that you refrain from using your cell phone while conducting business when checking in. 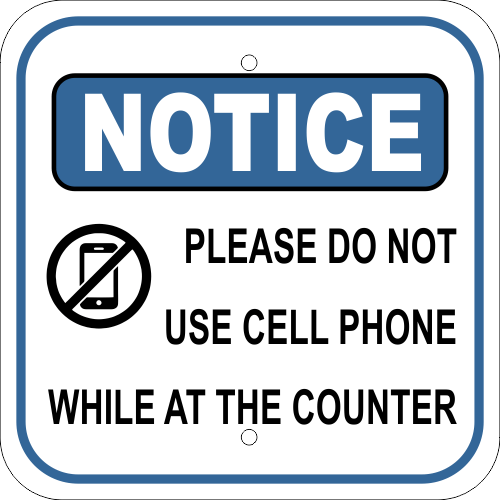 This Please Do Not Use Cell Phone at Counter Notice Sign will prominently tell your customers to be respectful while taking care of their business. For indoor or outdoor use. This sign is printed on vinyl and mounted to heavy duty .063 aluminum. Two pre-drilled holes are at the top & bottom and perfectly spaced for use on U-Channel Posts, a fence, or the side of a building. Aluminum has 1.25” radius corners to protect you from sharp edges and gives a professional finished appearance. For longer life of your printed sign, add lamination for a few dollars more. Lamination helps protect from UV rays to extend the life of your sign and is recommended for outdoor signage. For indoor use, the vinyl print & aluminum will last for several years. Order this Please Do Not Use Cell Phone at Counter Notice Sign will save you the hassle of asking your customers to give them your undivided attention. Most orders ship the next day. Order yours today!